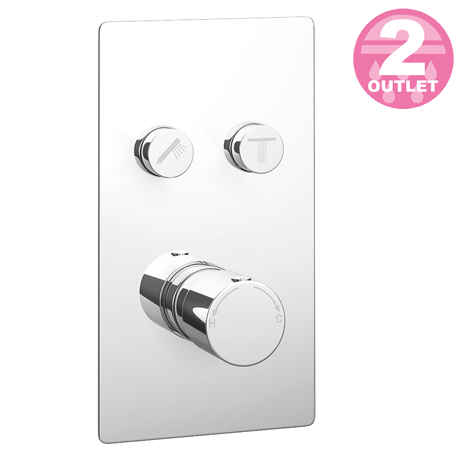 The wall mounted modern Cruze push-button operated shower valve features instant start/stop activation control for 2 outlets and a stunning minimalist design. Offers thermostatic showering via easy-to-operate controls, the round handle controls temperature and the push-buttons operate two shower accessories. This 'twin' shower valve is perfect for installing in a concealed arrangement, valve diverts between two shower accessories: fixed head/slide rail kit, fixed head/body jets or slide rail kit/body jets. Select push button On/Off control for 2 outlets. Please note: Shower valve will not work efficiently on a gravity fed tank system, unless a good booster pump is installed.